Time. There's plenty of it. Especially free time. Unless you are Penelope. Her mother plans out every single thing Penelope is going to do every single day. No free time, at all! Until one day, Penelope finds a hole in her schedule. A big one. A whole day, nothing planned. Penelope wants to be a writer, so maybe she could write all day... But remember that huge hole? What do people do with holes? They fall in. And that is exactly what Penelope does. Penelope falls into a mysterious land called "The Realm of Possibility." There she meets Dill, a young man who is an explorer. Dill tells her about the history of the Realm, how it was created by the Great Moodler, a woman who later disappeared when a man named Chronos took over. He had an army of Clockworkers, men and women who were devoted to serving him. Shortly after his takeover, he had his Clockworkers build clocks everywhere, and forced people to obey him. But before Chronos arrived, nobody cared about the time. Everyone simply... moodled. And what is moodling, you ask? Well, it is simply letting your mind wander. When Penelope meets Dill, they set out on a quest to find the Great Moodler and defeat Chronos, and on the way they will take an adventurous Flight of Fancy, push their way through the Naughty Woulds, and find various types of mushrooms. Penelope makes friends with the people and animals she finds in this strange new land. But Penelope needs to find the Great Moodler, because she wants to prove to her parents that writing is not a waste of time, but she can't, because she has writer's block. Only the Great Moodler, with her endless imagination, can help her. Will she ever find the Great Moodler, and even if she does, how will Penelope ever get back home? This is a truly fascinating story recommended for anyone who likes a seriously weird book. This book is a lot like The Phantom Tollbooth, with its "Island of Conclusions." In this book, the main character, Milo, has a lot of time on his hands (unlike Penelope!). He finds a tollbooth in his room, goes through and is transported to where he discovers a strange land, with places like "Dictionopolis" and "Digitopolis." What follows is a big adventure, which I'll tell you about in my next review! The Lost Track of Time will eventually let you go, that is, when you've finished the book, unlike the grip of time, which will never, ever, let you go. Daddy's afterthoughts: A modern take on the classic Alice in Wonderland/Wizard of Oz/Narnia trope of falling through into another world to learn a life lesson, this book is a fun romp, with a Willy Wonka-esque/Oz-like sensibility. 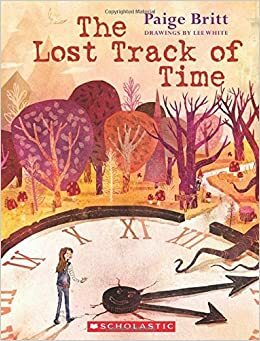 This book does pair well with The Phantom Tollbooth, so be on the lookout soon for her next posting! Good job, Julia! Another one we'll have to pick up.